How to flip/turn the board? Flipping the board in Analyze This (and most of our Chess apps) is probably the easiest amongst all the other Chess apps out there! 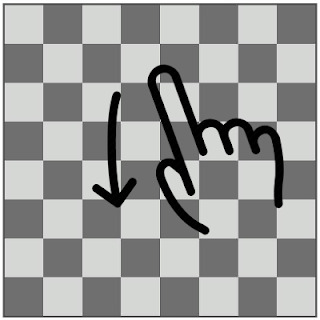 Just swipe your finger top down on the board to flip it! There are two main ways you can import your own .pgn file into Analyze This app. Method 1 and probably easiest of all is that you can import your pgn if you have it in your mailbox or Drive or Dropbox. 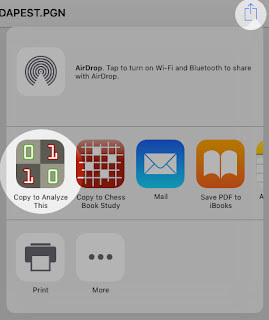 Choose the Share/Copy Into option from your App (Gmail, Drive, Dropbox) and then choose "Copy to Analyze This"
After this the pgn will get copied inside Analyze This app and the app should show the list of the games. Just in case the games are not automatically loaded, you can open the pgn by tapping the Folder icon inside Analyze This app. Copy your pgn file from your PC to the Analyze This app's Document folder using iTunes File sharing. Tap on a move in the notation to select it. Then tap the same move again and it would show a popup with more options including "Delete this move". Choosing that option will delete the currently selected move and all moves after that. Delete button. Select it to delete the game. How do I download all games as pgn? Is there a place or field to make comments on the game?